We’re proud to present the winners in this year’s National Kitchen & Bathroom Association Excellence in Design Awards. 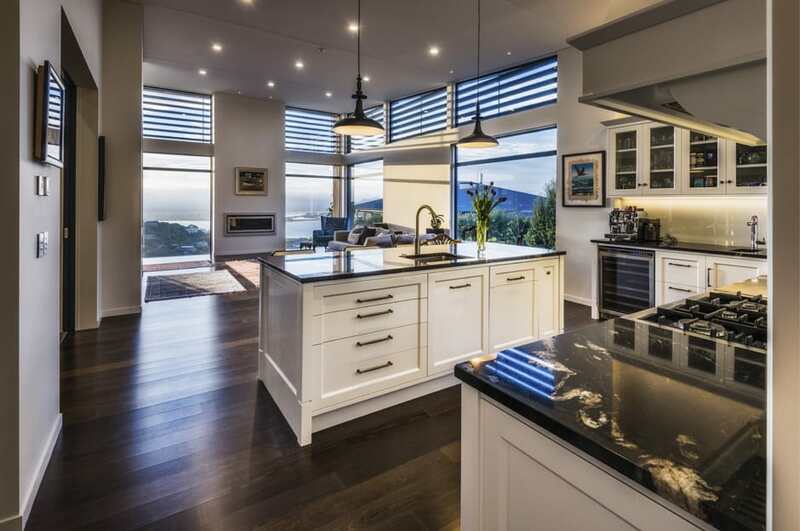 A beautiful pohutukawa tree creates privacy for this kitchen, which is bathed in sunlight and has a fantastic view of a black-sand beach. The look is clean, modern minimalism, enhanced by a timber ceiling and side panels for a natural touch. 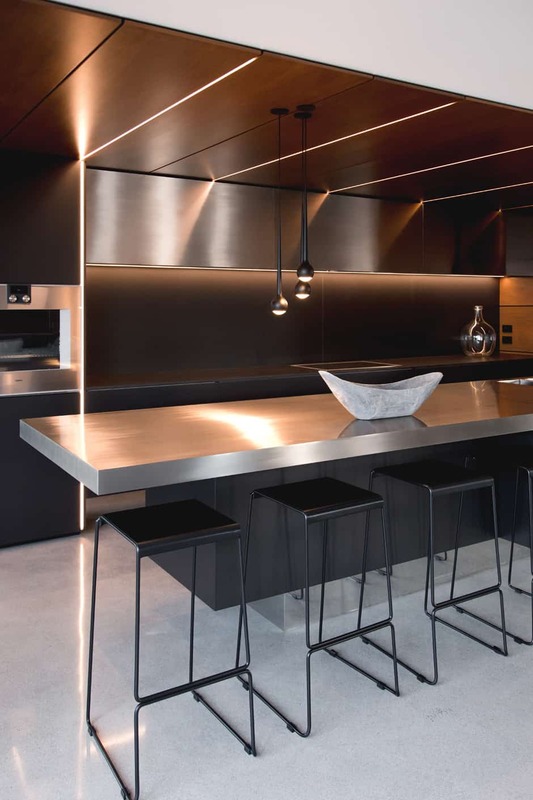 Black cabinets with non-handle details provide a striking contrast to the iron-sand concrete flooring. The floating-style island features a satin stainless-steel benchtop with ample room for eating and entertaining. The rear bench and splashbacks provide generous cooking space and added durability while creating the feel of a dark and moody commercial cooking space, with plenty of lighting where needed. Overhead, the sleek stainless-steel cabinets are designed to blend with the island. An adjoining scullery ensures the aesthetics of the main kitchen aren’t compromised by the appliances and functional aspects of food preparation and storage. Because the fridge is in the scullery, a Fisher & Paykel CoolDrawer was added to the main kitchen for ease of access. Benchtops and splashbacks: Dekton Domoos. Cabinetry: Painted to match Domoos. Drawers: Blum Legrabox. Hinges: Blum Clip Top Blumotion. Handles: Blum Servo-Drive and Dekton Domoos. Island benchtop: Satin stainless steel. Flooring: Polished concrete. Sink bowls: Mercer stainless steel. Ovens and cooktop: Gaggenau. Fridges and dishwasher: Fisher & Paykel. Extractor fan: Schweigen. 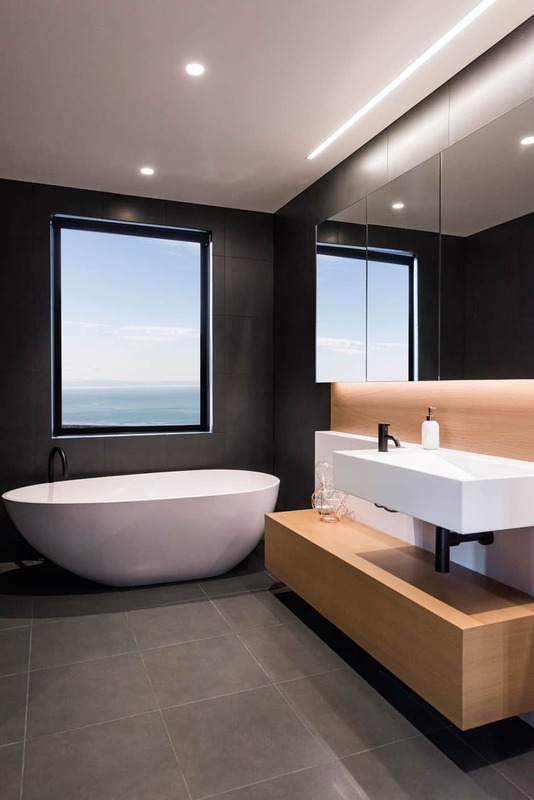 Some of the highlights of this bathroom include its sharp, clean lines and bold forms; use of modern finishes with minimal fittings and fixtures; ample storage; enclosed walk-in dual shower zone; and freestanding bath. The design makes a statement on entry with the large engineered stone bath set under a window with a view of the landscaping beyond. Next to this is the crisp line of a custom-made vanity bowl and plinth set off the back wall. Here textured engineered veneer is used to break the sharpness and juxtapose the boldness of the forms. Storage is provided below in a veneer-mitered box and above the large mirror unit. The large shower zone is set behind a tiled wall, and the toilet is tucked into the opposite corner, hidden on point of entry. The strong palette and mix of finishes provide a sense of personality, the layout displays a clever use of space, and the play on forms and finishes ensures the desired connection to the architectural home. Cabinetry carcasses: Melteca Black Velvet. Hardware: Blum. Drawers and back panel: Prime Panels Quarter Cut American White Oak in Clear Mirotone 10% gloss. Vanity and plinth: Corian finished in Designer White. Vanity tap: Vola. Basin: Custom-formed with the Corian, front mounted to plinth, with pop-up waste. Lighting: Häfele recessed LED strip. Floor and wall tiles: RIN Liquorice Matt. Grout: Aba Flexgrout Ultrasmooth with Microban. Shower mixer: Vola. Shower slide: Vola one-handle mixer with hand shower. Shower waste: Allproof square grate. Bottle trap and pop-up waste: Fantini. Heated towel rails: DCS Siroco Square. Bath: Progetto Egg. Bath pillar tapware: Fantini Nostromo. Bath mixer: Vola. Toilet: Duravit back-to-wall. Cistern: Tropea 3 Pneumatic in-wall. Toilet brush and holder: Inda Mai Love. Toilet roll holder: Vola T12. Towel hook: Vola T18. The uncluttered design of this kitchen has a sense of ‘rawness’ to it, yet stays true to the modern architectural style of the home. It’s set out in a galley format that extends into a working pantry that allows the food preparation areas to remain separate from the main space when entertaining and is equipped with a second sink, fridge, microwave and dishwasher, plus wine storage and hidden and exposed storage. 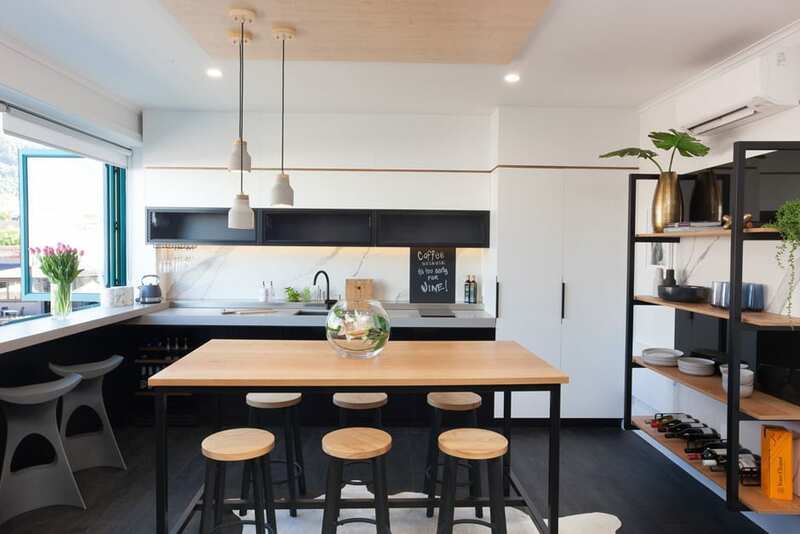 In the main kitchen, a marble bench and splashback run the length of the rear wall, housing the cooking zone and accompanied by drawer storage. On the opposite side, the preparation and washing areas feature a large raw-cast concrete bench. Storage hidden behind cabinetry and integrated appliances help to maintain clean lines. Overhead, a slatted timber louvre conceals a heating system and provides a textural effect, the striking dark veneer contrasting with the concrete and honed marble. Cabinetry carcasses: Melteca White Gloss. Hardware: Blum. Main kitchen door and drawers: Prime Panels Crown Cut American White Oak veneer finished with Dark Walnut Mirotone. Handles: Blum Servo-Drive. Scullery door and drawers: Lacquered Resene Wan White. Insert pull handles: Katalog. Flooring: Stained American white oak. Hob benchtop and splashback: Marble Slat Vein honed with penetrating seal. Scullery benchtop: Plate Satin stainless steel. Single sink: Quadra. Tap: Perrin & Rowe. Splashback: Glass in Resene Wan White. Island benchtop and downstands: Exposed aggregate polished concrete. Single sink: Custom-made stainless steel. Tap: Perrin & Rowe. Handles, sink basket and vegetable drawers: Häfele. Bins: Blum. Oven, hob, dishwasher, fridge, freezer and extraction: Miele. a powder room, with a shower for use on the odd occasion. A simple solid oak trestle table keeps things light and open and avoids the use of complex cabinetry. 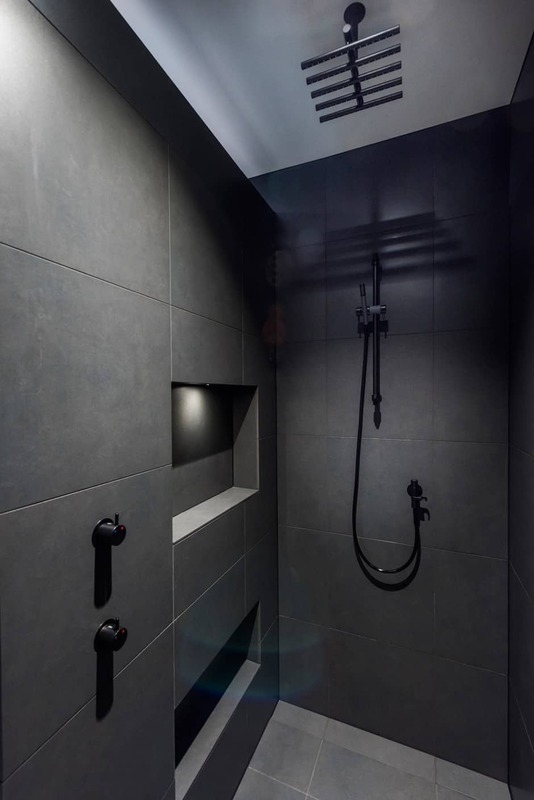 The challenge of creating a smooth, seamless finish with the addition of the fixtures and fittings to the split-face wall was overcome by waterblasting the rough areas where tapware and fixtures were being fitted to the stone. The lighting is minimal, with task lighting in the ceiling and two mini LED spots that wash down the wall either side of the mirror, combining with recessed LEDs below the timber top to further emphasise the textural elements. 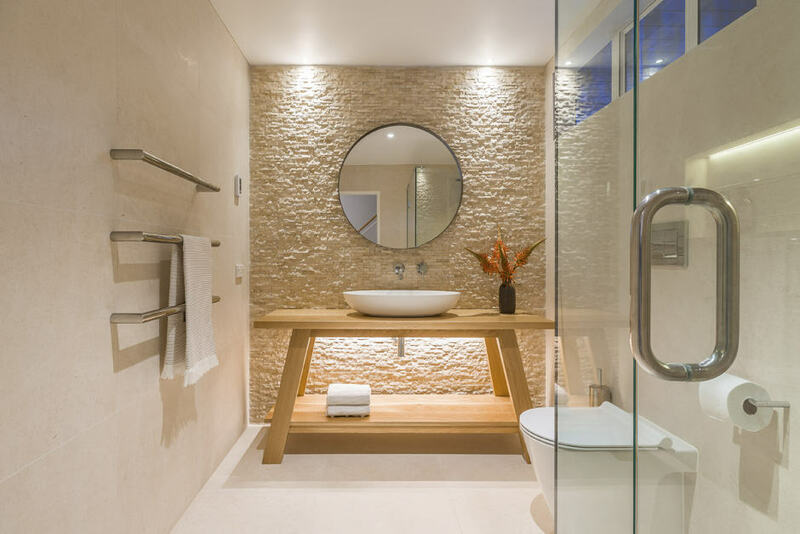 Earth tones and a mix of natural and organic materials (including limestone, stone and timber) are key components that help to bring balance and structure to this relaxing spa-like space. Cabinetry: Custom-designed solid oak trestle table with resin coating for waterproofing. Ceiling: Resene Quarter Rice Cake. Walls: Split-face travertine and sealed limestone. Flooring: Sealed limestone. Tapware: Progetto Buddy. Heated towel rails: DCS Scarpa. Toilet: Catalano Zero 55 floor-mount with soft-close seat. Cistern: Speedo mechanical in-wall. Mirror: Custom-made with bronze frame. Accessories: Fantini Young. In a simplified traditional style, this kitchen is designed to be the dominating presence in an open-plan living space. Deeply recessed lacquered doors, granite and restrained detailing are used to striking effect, while extensive lighting highlights key features, ceiling and walls and brings the room dramatically to life at night. The kitchen is partially divided from the adjoining scullery by a wall that has a large canopy extractor and freestanding oven on the main kitchen side, and a wall oven, microwave, cookbooks and tall storage on the scullery side. The scullery has two sinks, a dishwasher, plenty of bench space, multiple drawers, shallow storage for preserves, display areas, glass-fronted cupboards and open shelving. An ice-maker fridge sits between the two spaces, and beside the main fridge is a drinks area with a wine fridge, sink, hot/cold/soda tap, coffee machine and glasses storage. Cabinetry: Bevelled framed doors in lacquered Dulux Half Haast 50% gloss level by MF Turnbull. Drawers: Blum Legrabox. Handles: Elite Hardware. Bins and fittings: Häfele. Benchtops: Artisan Stone Titanium granite and Corian Witch Hazel to scullery. Splashbacks: Glass. Lighting: LED Warm White continuous strip lighting. Pendant lights: Accent Lighting. Sinks: Reginox. Tapware: Hansgrohe and Zenith. Oven, microwave and dishwashers: Electrolux. Fridge: Whirlpool. Wine fridge: Delonghi. Extractor: Sirius. Coffee machine: Rocket. A stylish, traditional kitchen with a hint of modernity, this space stands proud within a newly renovated grand old home, yet is soft enough to complement the feel of the romantic villa. 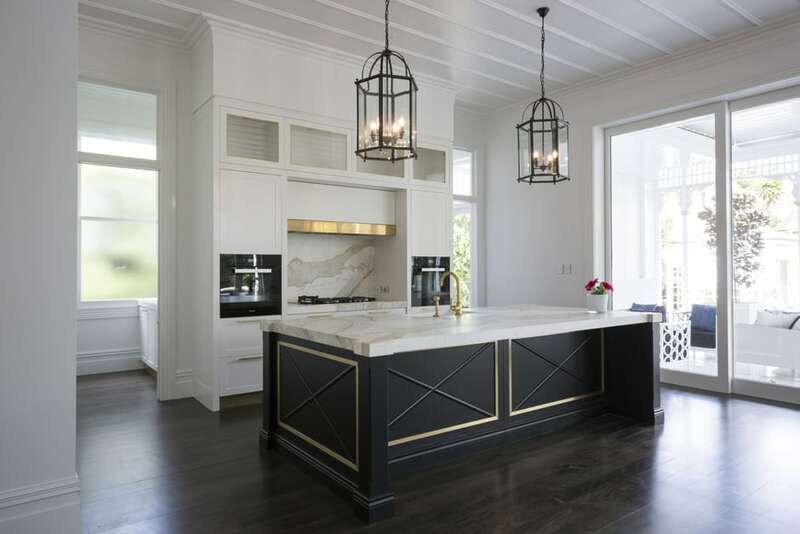 The criss-cross detailing on the island has a solid brass bar bordering it and elegantly mitred around the island panels. The brass handles, splashbacks, kickboards and pelmet add an additional element of style that matches every hinge and window latch in the house. The Calacatta gold marble is soft and dreamy and the checked corners on the island are a simple detail in keeping with the traditional theme. Two fridge/freezers, a dishwasher and a rangehood are fully integrated, and a scullery provides a space for on-bench appliances and hidden food preparation when entertaining. The scullery had a low window that was unable to be moved, so the bench was set up to neatly meet the sash. Cabinetry exterior: MR MDF in Resene Satin Lacquer Black White and Black. Kickboard: Abet Laminati Brass HPL. Cabinetry interior: Melteca MDF MREO, Black, Pearl finish and Prime Panels MDF MRE0 Whiteboard, Gloss finish. Benchtops: SCE Stone & Design Calacatta Gold marble and Nano Glass. Splashback: SCE Stone & Design Calacatta Gold marble and Abet Laminati Brass finish HPL. Lighting Häfele Loox LE. Hardware and accessories style: Inner Spaces Shaker. Drawers: Blum Legrabox with Ambia-Line inserts. Door hardware: Blum Inserta hinges and Tip On for Aventos HK. Handles Knobbery. Glazing: Metro Glass. Twin bins and space tower pantry: Blum. Sinks: Cabro Sergio Manor, and Heritage Hardware Robiq 500 and Robiq 400. Tapware: Plumbline Nicolazzi. Ovens, dishwasher and fridge/freezer: Miele. Hob: Wolf. Rangehood: Qasair. Waste disposal: Insinkerator. 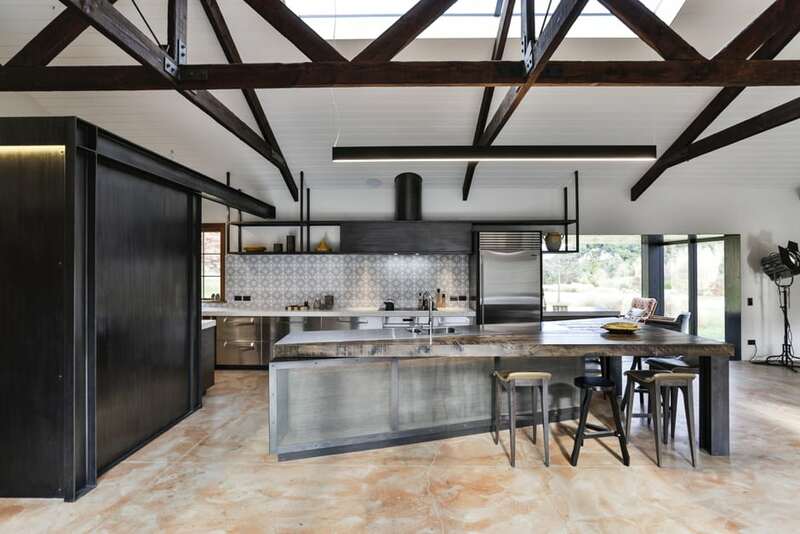 In turning a hanger originally built to house a classic car collection into a kitchen, inspiration was drawn from the rustic beams, oversized doors and chunky steel hardware. 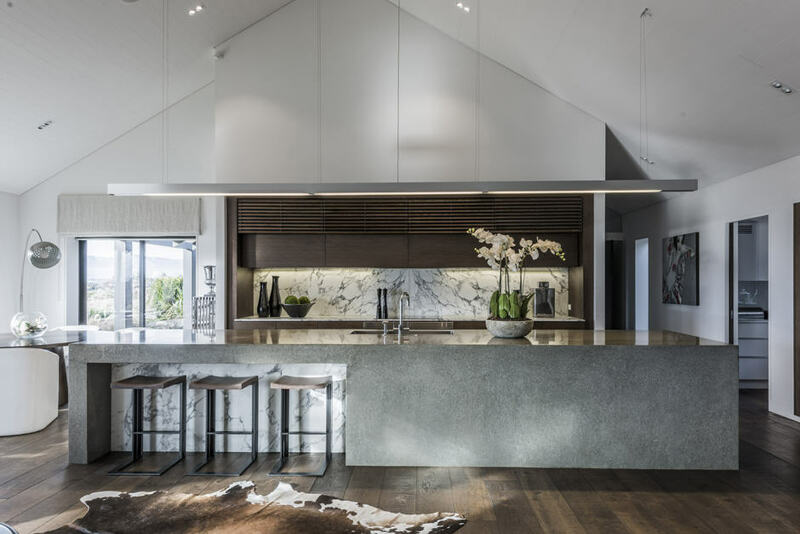 The strong angles of the island allow it to overlap into the living area, and its thick French oak timber top contrasts beautifully with the brushed stainless benchtop. 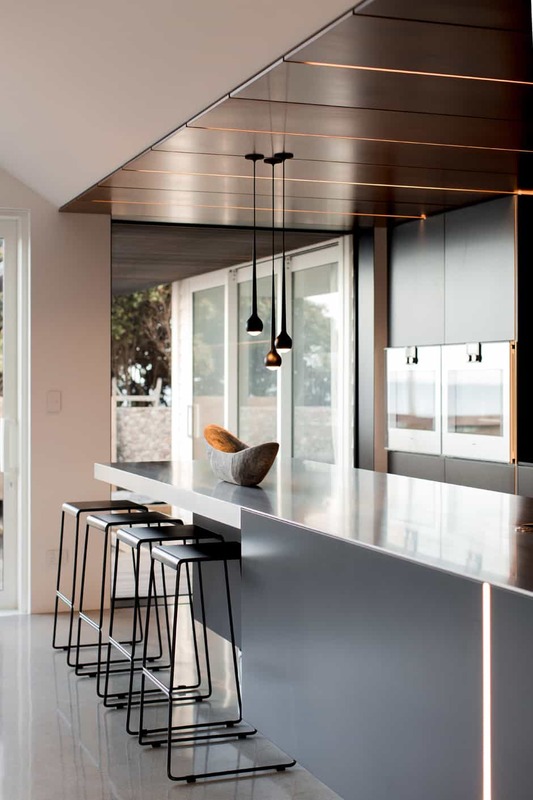 The front of the island is framed in steel and backlit to reveal the warmth of the timber void behind it and offer a romantic glow for evening entertaining. Celebrating both old and new, a steel partition and sliders separate the main kitchen from the scullery; the two directional sliders can expose various servery options or close off the scullery. Stainless steel drawer fronts pair with perforated steel shelving that houses a rangehood, wraps the fridge and cantilevers into a sun-soaked relaxation nook with a view of the garden. Cabinetry: Brushed stainless steel joinery fronts, Prime Panels planked rustic oak veneer joinery fronts, AE Tilley perforated sheet 186 island front framed in mild steel, Melteca melamine warm white scullery joinery fronts and shelving, mild steel with iron paste finish, and Formica magnetic/white board joinery front. Benchtops: Brushed stainless steel and Caesarstone Statuario Nuvo. Island benchtop: CTC French oak timber flooring, stain finished and bandsawn skipped. Hardware and drawer organisation: Blum. Sinks: Mercer. Tapware: Hansgrohe and Dornbracht. Water filter: Insinkerator. Black knob: Heritage Hardware. Tiles: Moabell. Ovens: Wolf and Miele. Cooktop: Miele. Fridge/freezer: Sub-Zero. Rangehood: Ventech. Dishwasher: Asko. 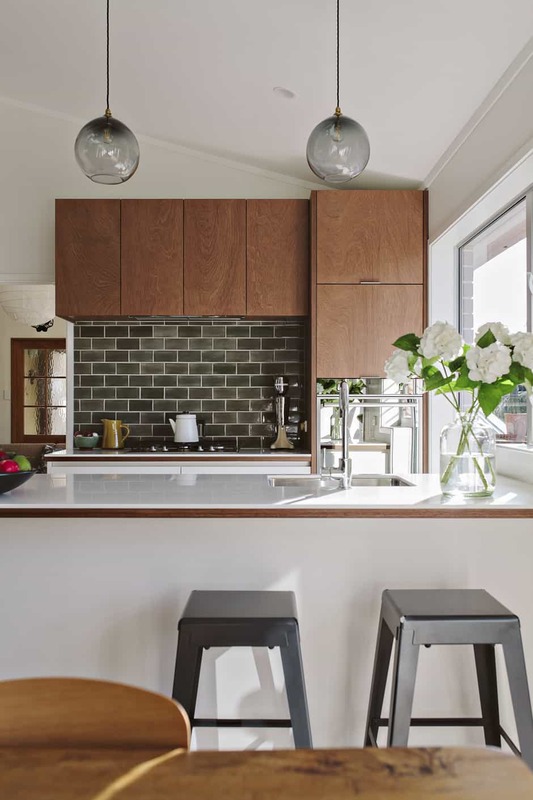 Blending seamlessly into an open-plan space, this renovated kitchen has a mid-century modern aesthetic in keeping with the home’s era and a galley layout that allows better flow in the small space. The bay window was replaced with a large picture window down to the floor for maximum sunlight, while louvres above the island provide ventilation. as storage units from the opposite side of this area, so no space was wasted. The splashback’s handmade tiles are enhanced by the use of keruing timber, and pendant lighting adds a practical yet delicate finishing touch over the island and nook, which deliberately does not have a door, in order to create the feeling of space and allow the floating timber display shelves to remain visible. Cabinetry: Keruing plywood finished in Clear Satin, and Sage Laser Edge in White Supermatte. Drawers: Hettich InnoTech soft-closing drawers and Bi-Fold system, and Häfele Lift-Up systems. Handles: Häfele. Benchtops: Corian Glacier White with keruing plywood substrate finished in Clear Satin. Lighting: Häfele LED strip lighting with diffuser and sensor switch, and Monmouth pendant lighting. Sinks Valoré. Taps: Greens. Tiles: Middle Earth. Bins: Access. Stools: Al Keating. Ovens and hob: Ariston. Fridge/freezer: Fisher & Paykel and Haier integration kit. Dishwasher and rangehood: Bosch. In the process of restoring this lakeside 1950s bach’s kitchen to its rightful era after a 70s renovation, a large sliding door was added to gain direct access to a new outdoor dining and barbecue zone, and a window was moved to create the wall area for the new design. 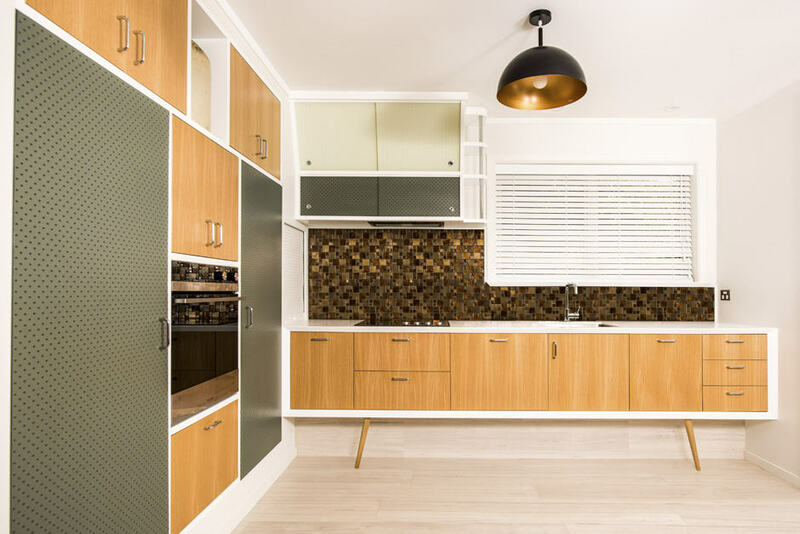 The oak wall cabinets are crafted to look like a piece of furniture, while the use of shadow board on the fridge and pantry are another nod to the iconic Kiwi bach theme. The racked cupboard has reeded glass and chrome pipe through rounded shelving. Facilities including a small table are provided as an indoor dining option. Cabinetry: White American oak on BB plywood, shadow board in Resene Viktor, and painted reeded glass and shadow board sliding doors. Benchtops: Laminex Solid Surface Chalk. Splashback: Copper mosaic tiles. Handles: Häfele. Sink and tap: Ikon. Hardware: Blum. Bin: Blum Servo-Drive. Oven, hob, fridge, rangehood and dishwasher: Fisher & Paykel. This compact kitchen is part of a multi-use office fit-out. 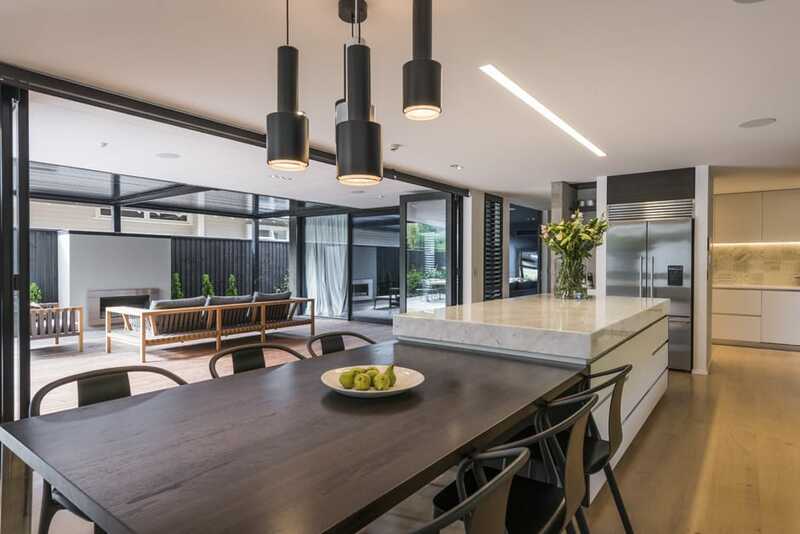 To avoid having a visible join in the main benchtop and to maximise the use of space, a raised stone bar leaner was introduced, running into the bifold windows. The extra depth of the sink area was used for a raised stainless-steel top complete with a panama fitting welded in with accessories for convenience. A Blum Space Tower was implemented as a pantry/storage system and a concealed small appliance area was cleverly covered by a Häfele Hawa pocket door system. 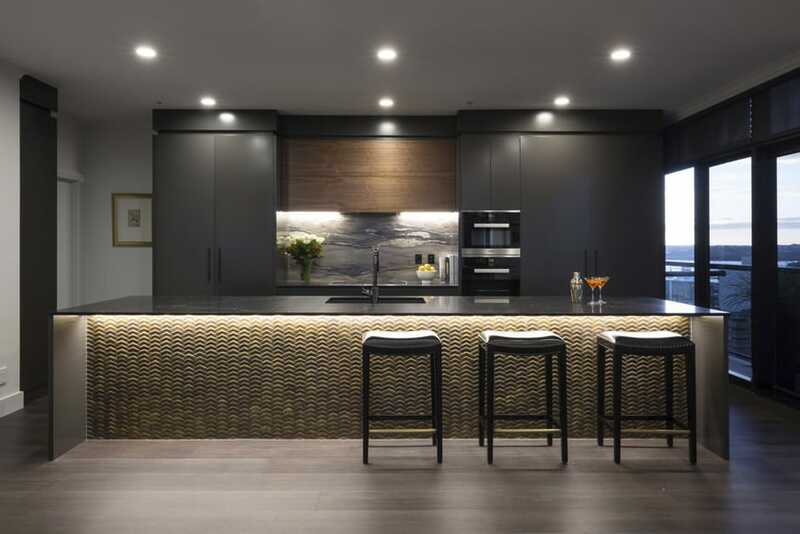 Black mesh cabinetry with internal lighting creates the illusion of space. Cabinetry: Melteca Storm interior and Melteca Snowdrift Satin exterior with PVC. Accent colours: Purecoat by Melteca Black Gloss and Melteca Affinity Maple Natural. Doors: Powder-coated aluminium and mesh. Benchtop: Caesarstone Raw Concrete. Sink: Ikon Clarksdale. Drawers, plate holders, bottle set and bins: Blum. Hob: Fisher & Paykel. Fridge: Baumatic. 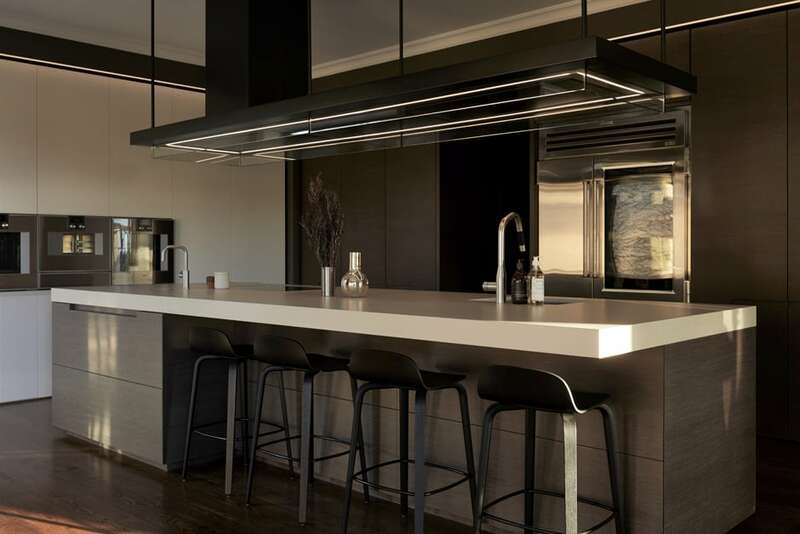 The renovation of this penthouse apartment aimed to create a luxurious city retreat, with the kitchen setting the scene for the rest of the home. Access to the laundry had been through the kitchen, so the laundry was relocated to an adjacent storage room and the space used to enlarge the kitchen and create entry points at both ends. To achieve this, the water feed and waste pipes had to be brought across into the new island bench, which necessitated accessing the ceiling cavity of the apartment below. It was a major undertaking, but the improvement in the accessibility, function and aesthetics of the kitchen was well worth the effort. 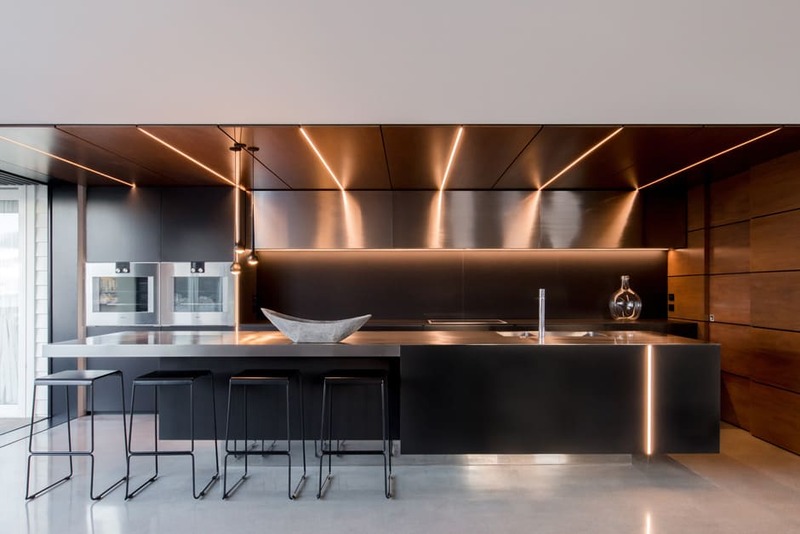 Dark cabinetry and benchtops create a luxurious and moody feel and are a strong anchor at one end of the large living space, complemented by the warm tones and texture of brass mosaic tiles, a richly coloured splashback and walnut veneer enhanced by LED strip lighting. Cabinetry: Resene Half Bokara Grey in Satin finish G50. Above hob: Bestwood Walnut Veneer with LED lighting strip. Drawers: Blum Blumotion and Legrabox with Ambia-Line inserts. Hinges: Blum soft-close. Overhead lift system: Blum Aventos HK. Pantry: bi-fold Hettich WingLine. Handles: Mardeco Arezzo 4030. Flooring: Vitality Deluxe 909 Washed Oak. Benchtops: Caesarstone Vanilla Noir. Sink: Heritage Hardware Aoraki 790-10 Nero. Taps: Hansgrohe Focus. Splashback: Formica Dolce Vita in a Satin finish. Bins: Enko Gollinucci. Oven, microwave/combi oven, hob, dishwasher, fridge, freezer, rangehood and waste disposal: Miele. A warm and welcoming space in a modern family home, a key strength of this Scandi- esque kitchen is its indoor-outdoor flow. The utilisation of different heights between the scullery, oven units and wall units helps to define the spaces. The marble-topped island is wrapped in oak panels that drop down into a bespoke dining table. Supported by a stainless steel leg to create a floating effect, it’s enhanced by a cluster of pendant lights overhead. This is a stylish, highly functional space with easy flow between the kitchen, adjoining scullery, workstation and outdoor entertaining and dining areas. The simplicity of the design and attention to detail create a wonderful canvas to which the owners can bring their own personality. Additional texture and interest is achieved through a porcelain-tiled splashback in the scullery, a veritable masterpiece in itself. Cabinetry: Matt lacquer texture coat in Resene Wan White, and stained American oak. Internal carcasses: Melamine Arctic White. Plinth: Aluminium. Benchtops: Carrara marble and Caesarstone Snow. Drawers and hinges: Blum. Sinks: Blanco. Taps: Hansgrohe. Ovens, cooktop and warming drawer: Gaggenau. Fridge and CoolDrawer: Fisher & Paykel. Rangehood: Award Appliances. Dishwashers: Asko. Waste disposal: Insinkerator. Part of a larger renovation, the concept for this kitchen sought to simplify the design and maximise the use of space while complementing the existing features of the home. Two bordering walls of cabinetry were built in and a central island was created to visually support the weight of a custom-made rangehood designed to bring a sense of intimacy to the generous space. Dark ash veneer and a stone benchtop combine to create a subtle complexity that’s enduring and timeless. The powder-coat finishes of the rangehood and central pivot door give a subtle sophistication, with a fine metallic mixed through the charcoal base. Lighting is used extensively too, illuminating the island and rangehood and the perimeter of the cabinetry. 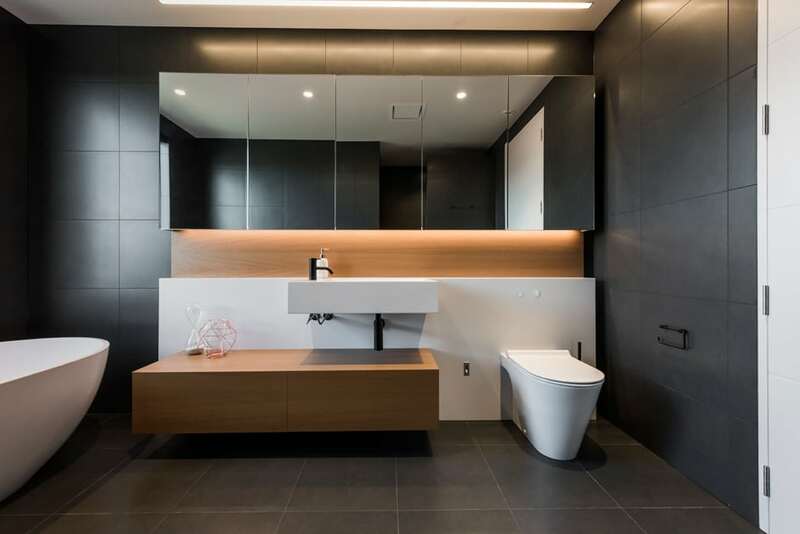 Doors and drawers that open and activate understated lighting highlight the quality finishes and inserts throughout. Cabinetry: Bestwood Melamine Carbon and Feather White, Laminex Allure Ash veneer and Corian Cameo White. Benchtops: Stone Italiana Basic Grain and Corian Cameo White. Drawers: Blum Legrabox Servo-Drive. Handles: Halliday & Baillie. Sinks: Quadra. Taps Metrix and Zenith. Bins and towel rail: Häfele. Ovens, hob and rangehood: Gaggenau. Dishwasher: Miele. Fridge/freezer and wine storage: Sub-Zero.